Discover the best rangoli design for competition with us. Make these freehand rangoli designs using rangoli powder, colored rice or flower petals. Rangoli is a traditional Indian art form. 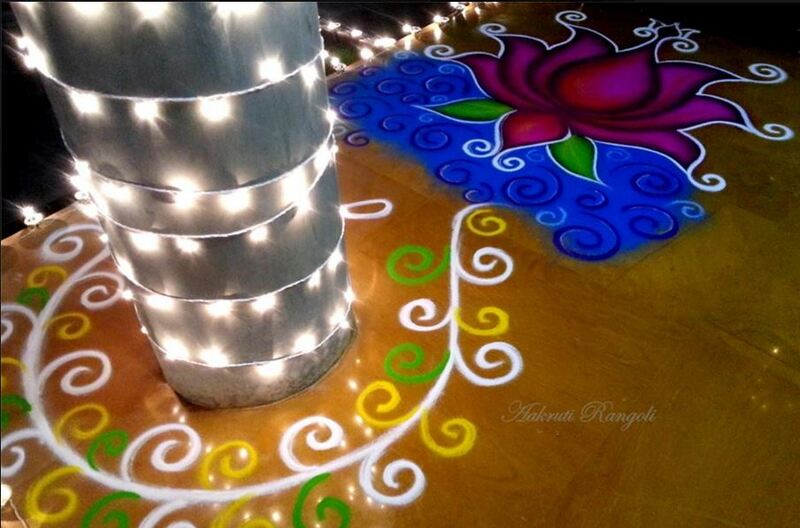 It is drawn on floor to adorn the main entrance of homes during festivals. Many rangoli competitions are held during these festivals in schools, colleges, offices, clubs and societies. Go through our rangoli design for competition and pick one. 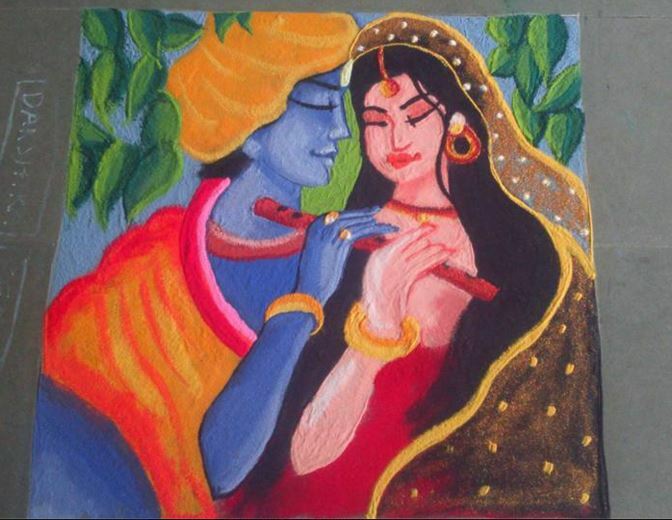 Go for this gorgeous Radha-Krishna rangoli design for Janmashtami competition. This is an easy rangoli and can be made by most of us. Check out this colorful 3D rangoli design. The color combination is great and is perfect for competitions. 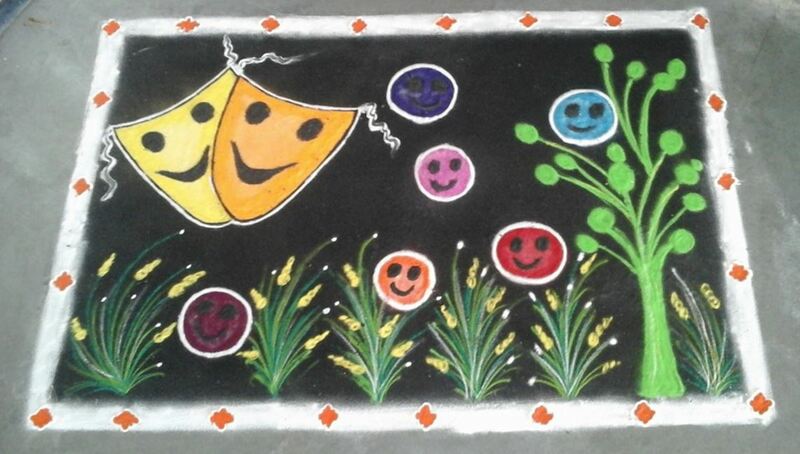 The theme of this rangoli design can be “poverty”. 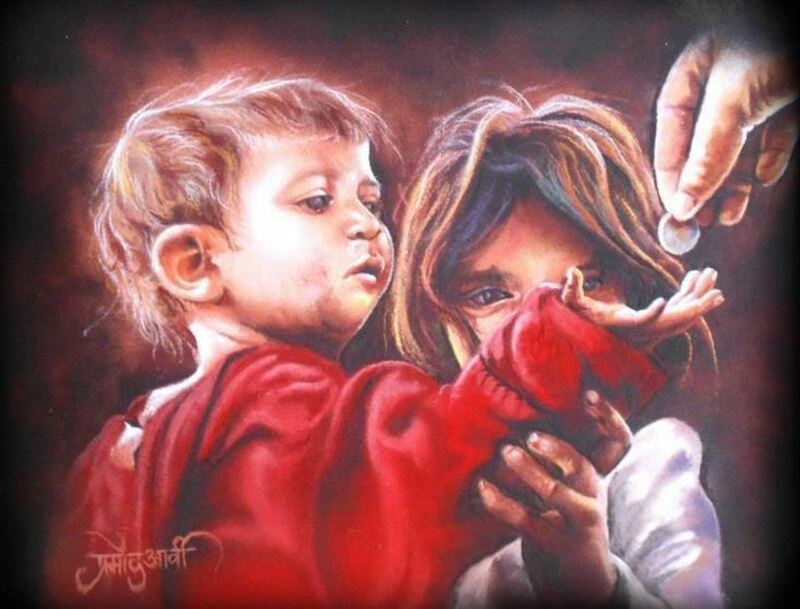 It shows how poverty can force children to beg. Choose nature as the theme for your rangoli design. 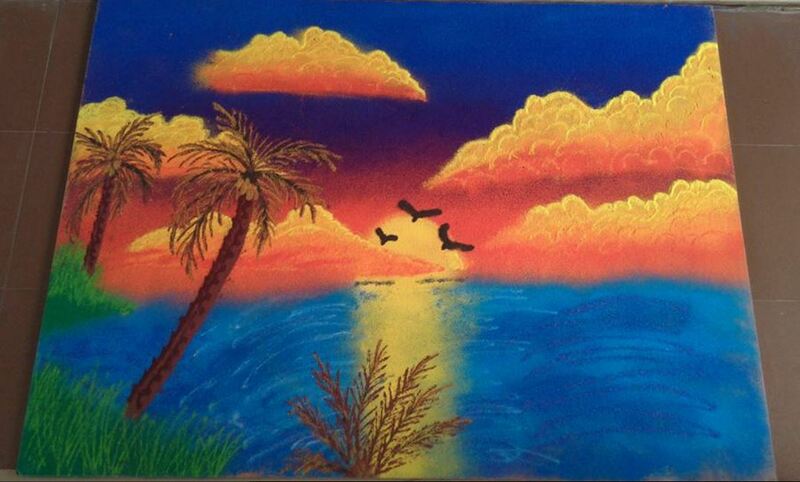 This is a stunning rangoli with depicting the beauty of nature at its best. 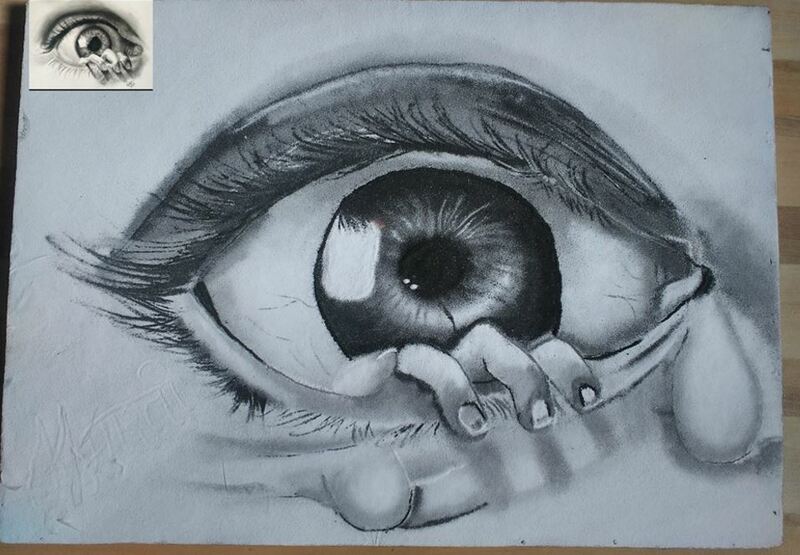 Eye is the window of one’s soul, take this theme and draw a rangoli design during the competitions. 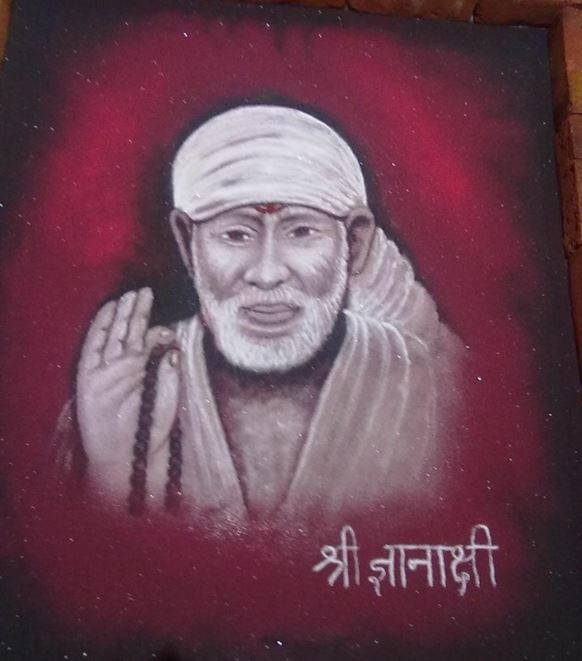 You can also make rangoli of Sai Baba of Shirdi. He believed that one God governs all, he believed in unity in diversity. 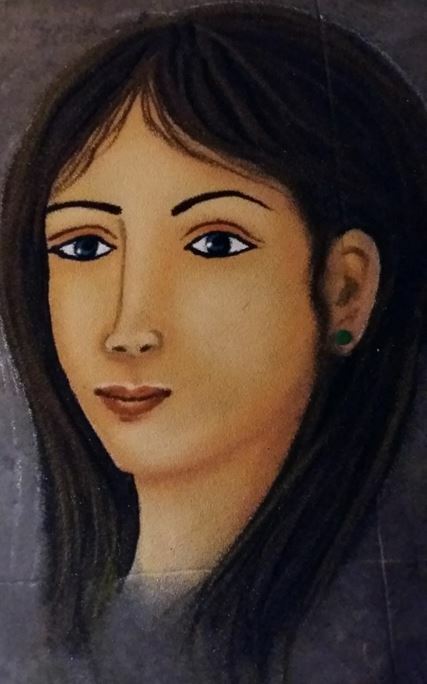 Make a portrait rangoli design for competition. You can choose to draw portrait of a famous personality or a common man. Peacock theme competition rangoli designs are very popular. 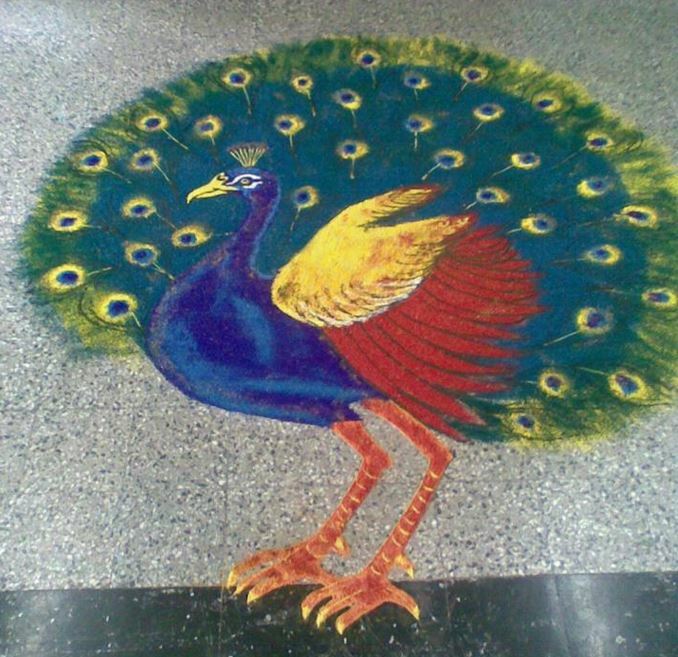 Here is an awesome peacock rangoli to inspire you. Kids can easily make this floral rangoli design with a sweet little butterfly. Use bright colors to make your rangoli. 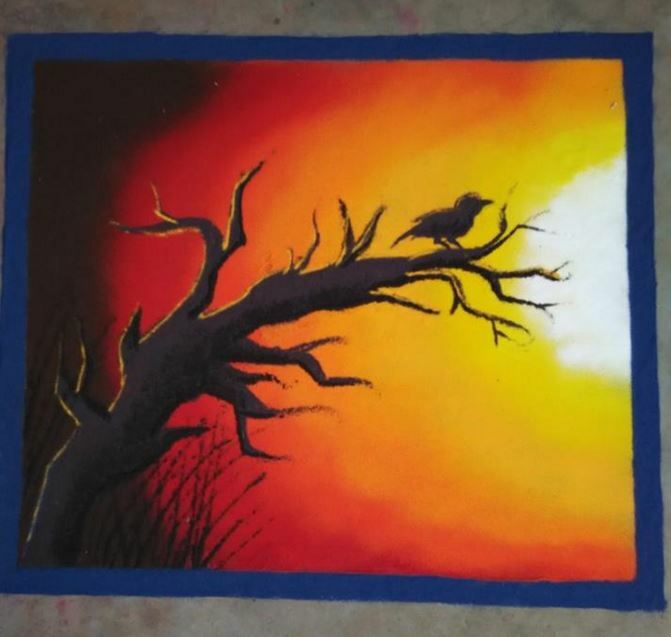 Here is a cool freehand rangoli that can be made for competitions. 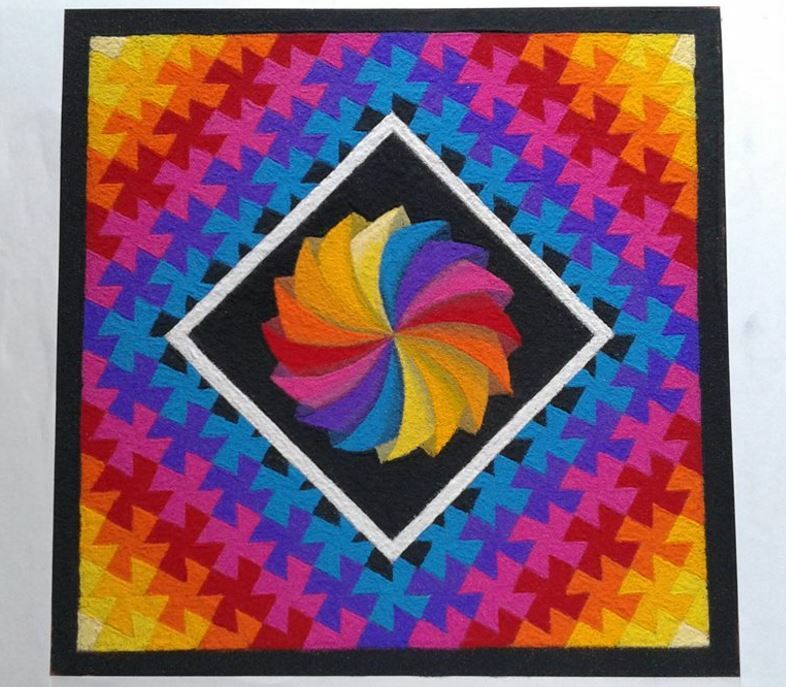 Add a pattern on its border to make it stand out. 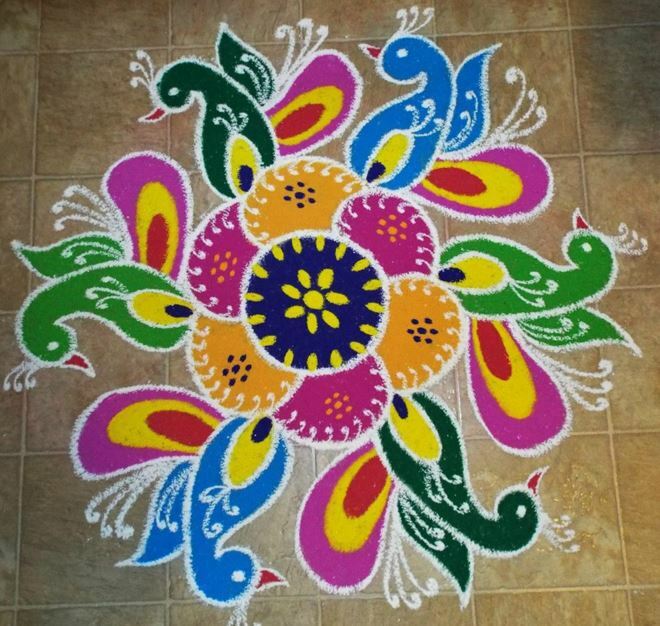 You need years of practice and lots of patience to master rangoli art. This is a perfect example of hard work and creativity. “The mask” should definitely be the theme for this cool rangoli design. You can also add a few smilies to your rangoli. 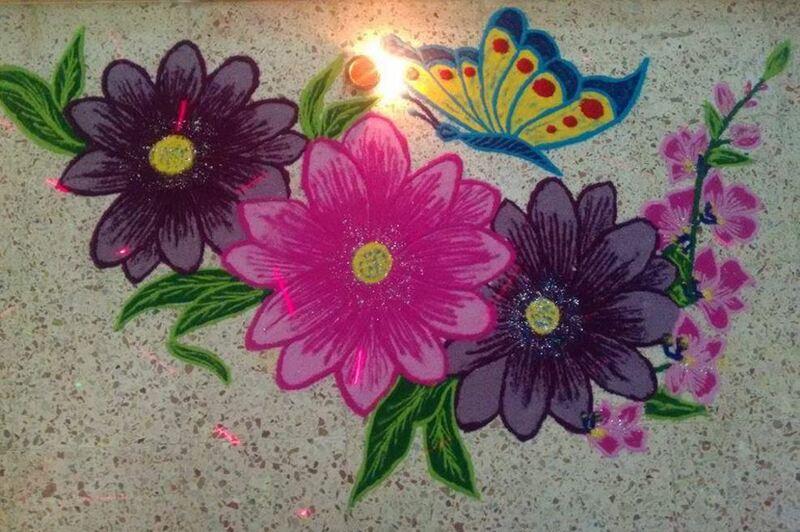 This rangoli is a simple shadow rangoli design. Kids and beginners can try making this during rangoli competitions. 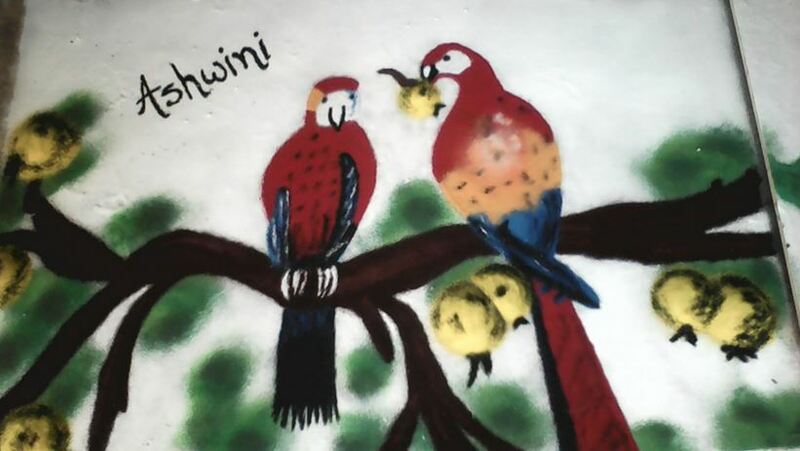 How about this cute parrot rangoli design? I think this one is a nice pick. Go for a geometric shaped rangoli pattern. 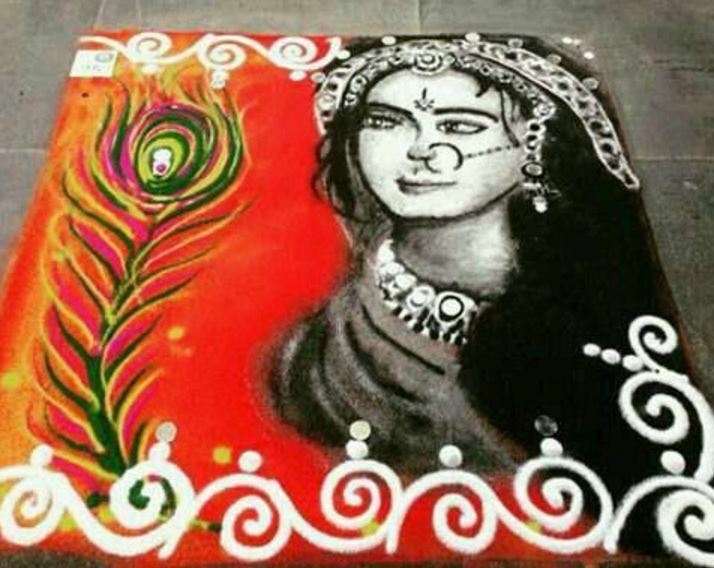 The above rangoli looks unique and interesting enough to win accolades in the competition. Don’t mistake this for a plate full of delicacies; it is actually a rangoli design. 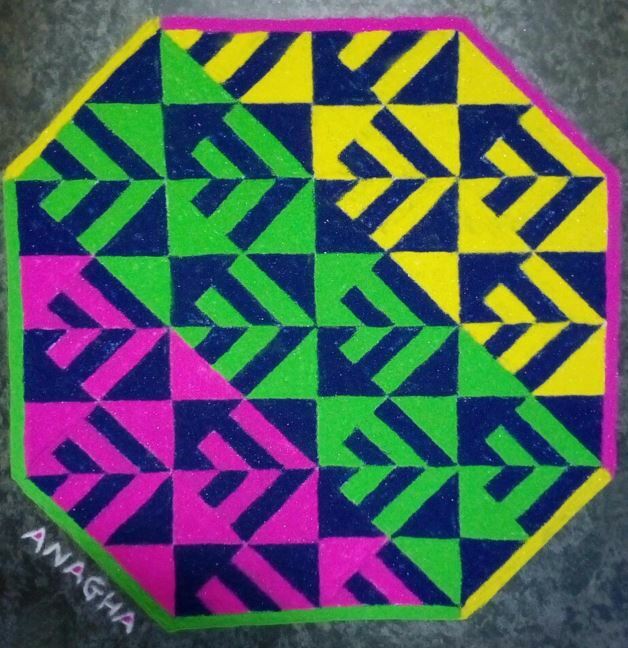 Here is a beautiful rangoli design with Sanskar Bharti patterns. Draw lord Ganpati in the center and surround it with Sun. Check out this amazing piece of art. 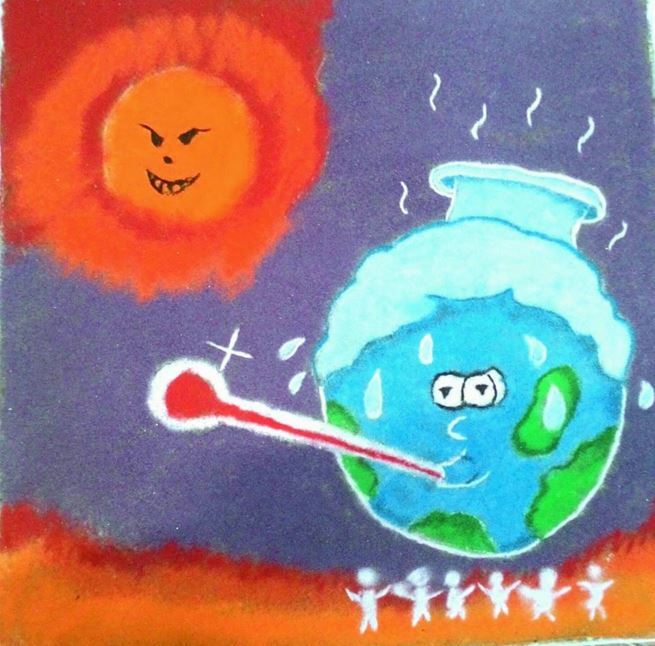 Go for this rangoli design for competition. 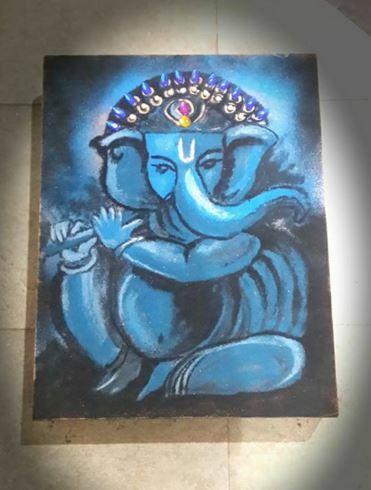 Make god Ganpati using blue color. The heat is on, summer is at its peak and people are begging for mercy. 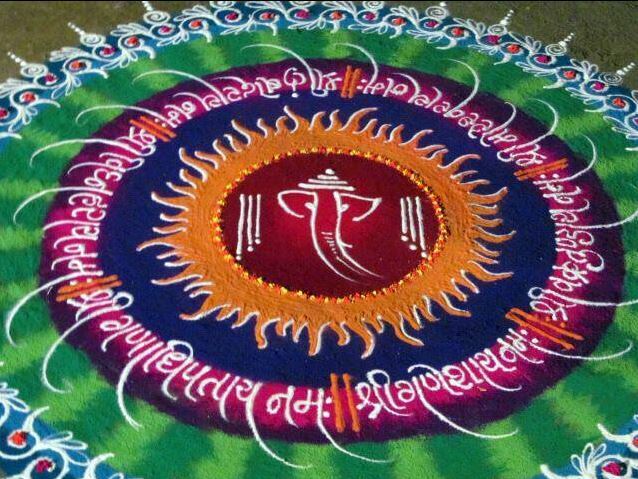 Keep this theme for your competition rangoli design. 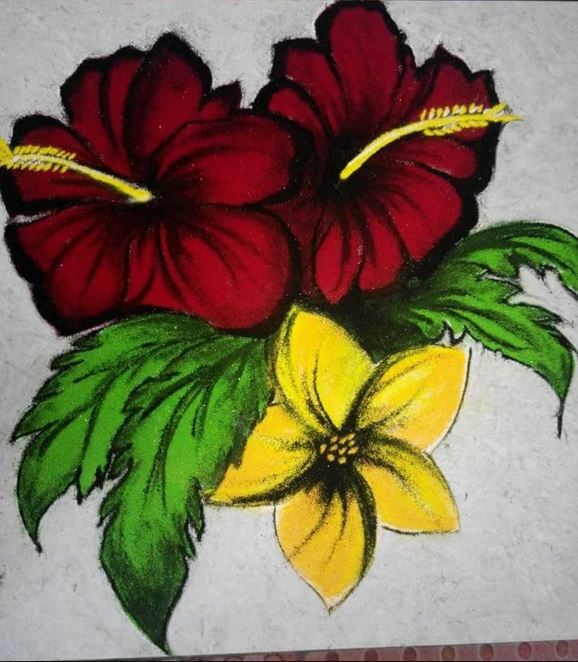 Use red, green, black and yellow color to make this floral rangoli design for competition. 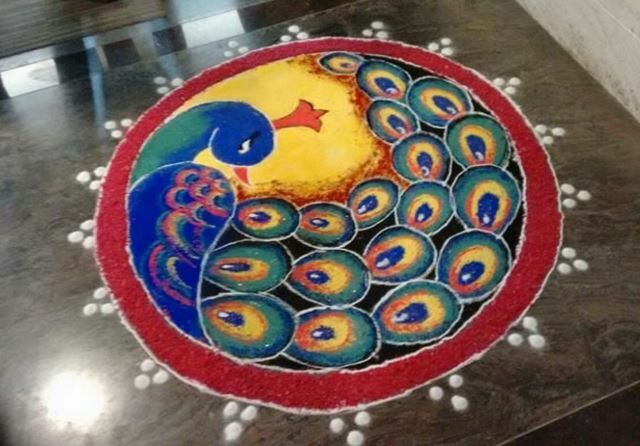 Take your pick on this simple peacock rangoli design. Make a circle and draw your rangoli inside it. 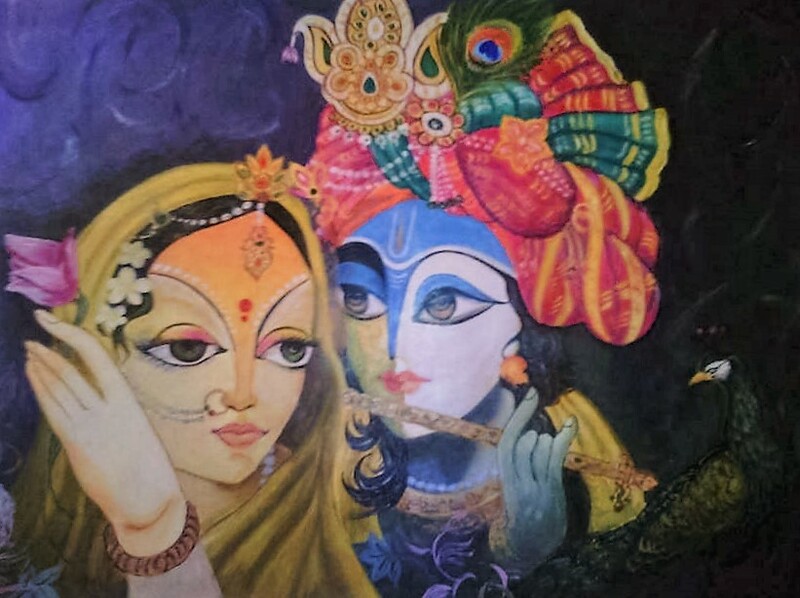 Here is another brilliant rangoli of lord Krishna that you can make during your rangoli competition. Mix floral and peacock patterns to get this awe-inspiring rangoli design. Fill it up with and be ready to get noticed. You need to be an expert at rangoli making to master this one. 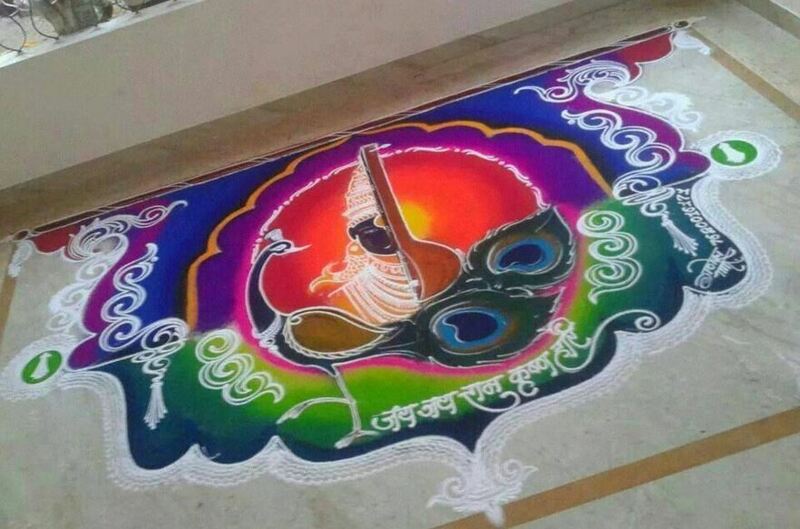 This lord Krishna rangoli can be made during Janmashtami festival. Choose this fabulous Lotus rangoli design for competition held during festive season. 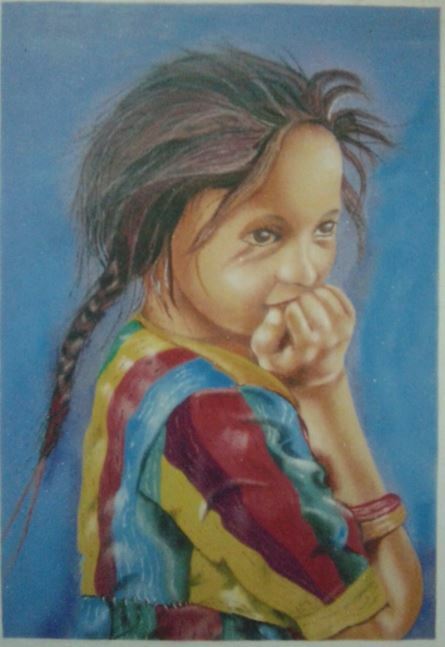 This entry was posted in Decor, Rangoli Designs and tagged Best Rangoli Design for Competition, Competition Rangoli Design, Competition Rangoli Designs, Concept Rangoli Design for Competition, Easy Rangoli Design for Competition, Easy Rangoli Designs for Competition, Free Hand Rangoli Design for Competition, Latest Rangoli Design for Competition, Rangoli Design for Competition, Rangoli Design for Competition 2016, Rangoli Design for Competition in College, Rangoli Design for Competition in School, Rangoli Design for Competition in Schools, Rangoli Design for Competition with Concept, Rangoli Design for Competition with Theme, Rangoli Design for Competitions, Rangoli Design for Diwali, Rangoli Design for Diwali Competition, Rangoli Design for Diwali Competition 2016, Rangoli Designs for Competition, Rangoli Designs for Competition 2016, Simple Rangoli Design for Competition, Simple Rangoli Designs for Competition, Theme Based Rangoli Design for Competition, Theme Rangoli Design for Competition, Top Rangoli Design for Competition by Homemakeover. Bookmark the permalink.